The suspect, Mayra Berenice Gallo of Santa Ana, was arrested at an undisclosed residence Tuesday. 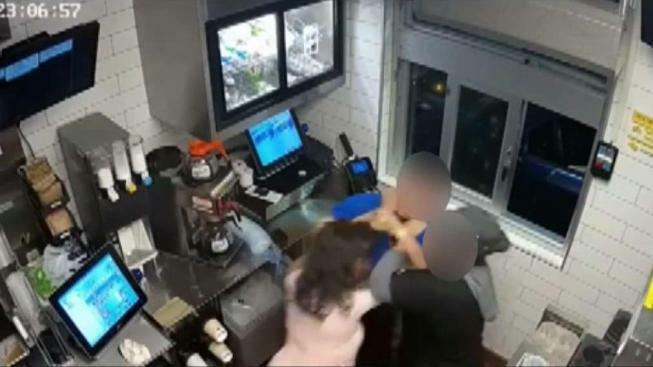 A woman who allegedly attacked a manager at a McDonald's restaurant in Santa Ana last month after demanding ketchup packets pleaded not guilty Thursday to misdemeanor charges of battery and obstructing or intimidating a business or customers. Mayra Berenice Gallo, 24, of Santa Ana, who had been held in lieu of $15,000 bail since her arrest on Tuesday, was released on her own recognizance after entering her plea. She is due back in court on Dec. 7 for a pretrial hearing. Santa Ana police Cpl. Anthony Bertagna said Gallo ordered food through the drive-thru lane of the restaurant at 1439 N. Bristol St. about 11 p.m. on Oct. 27. Apparently upset about her order, she allegedly confronted the 22- year-old female manager after getting inside through a back door that had been inadvertently left open by another employee. "She didn't get her ketchup or enough ketchup so she takes it on herself to go through the employee entrance and confronts the manager and the manager says, 'Hey, you have to go outside,"' Bertagna said last month. At that point, Gallo allegedly "became physically combative" and "pushed and choked" the manager, who reported pain in her elbow, back and neck, as well as a 4-inch scrape on her back, according to a Santa Ana police report. The suspect, clad in a pink shirt and gray sweatpants, allegedly choked the employee until a man -- later determined to be her boyfriend or husband -- walked into the restaurant, "intervenes and takes the (suspect) out of there," Bertagna said. Police received a "ton" of tips from the public when surveillance footage of the attack was released, Bertagna said, and four tipsters supplied a name. When Gallo was arrested, she was about to get in a car with the man who was seen in the surveillance footage ushering her out of the restaurant, police said. The manager, who did not want to be identified, told NBC4 last month that she was shaken by the attack. She said the customer was cursing and repeatedly asking for ketchup. "It happened all so fast. One of the girls (co-workers) did help me. The rest, I don't know, I wasn't really aware of what was going on," she said.